Paul Aubin has spent twenty eight years at King’s and in that time he has become a much loved and valued member of the school, not just with staff, but with the many boys who have been privileged to spend time in his class. His style of teaching has become legendary; if the space on the board is full there is always the floor to continue the lesson. If the original idea did not seem to go into the young mind, then perhaps repeating it from atop a desk would help. These techniques have ‘entertained’, delighted and educated generations of students. They are never forgotten. They are often recalled with delight many years later. The teaching was always done with vigour because Paul believed in what he was doing. He knew it was the most important work that could be done! The resources he used were legendary in themselves. If they didn’t fit in the classroom, the office, the resource room, there was always the back of the car. 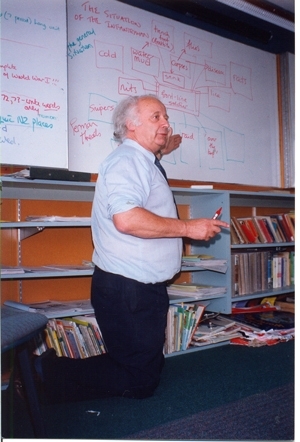 The professional teacher always shares what he has, and Paul is a professional There would be few staff members who have not sought Paul out to provide material for their lessons. To help other teachers reach their potential was and I’m sure will forever be a guiding principle for him. He is a lover of rugby, a doyenne of cricket, who every year turned out to coach the first or second or third eleven hockey team. In latter years he even drove from car park to field, determined to get there. As a staff member he will be really missed. He has a quick turn of phrase, and a ready smile. He is a sweepstake organiser and a determined pool player. But most importantly he is a nice guy. He will always listen, offer advice if asked, and be a friend through all times. He has given so much to those he has taught and to those who have taught alongside him. His presence on the staff will be sorely missed.